I'm frustrated and discouraged. I've had the boat out of the water for 3wks trying to find and fix a leak. I keep getting 1-3 inches of h2o in the bilge every hour or so. I found numerous problems and fixed. - replaced fuel lines and vent hose. while I was at it and put a new fuel sending unit in..
....yet there's still water...i get that this is an old boat, 1992 Sunsetter, but I shouldn't have water coming out of the floor. This could only mean that water is getting between the floor and the hull, and running to the back of the boat and finding a little pin hole to come out of. One thing I'm wondering...what keeps water from coming into the boat from where the prop shaft enters? Could there be another seal where the prop shaft meets the hull? I can't really see how that is sealed. I put shaft packing rope in the nut closest to the engine but is there more than one place I'm supposed to repack? I think you're talking about the same thing here, but @footndale has a good point. I'm going to assume you've put it on the water and spent time looking in the bilge for obvious leaks? Assuming the source of the water is not high up on the boat (like rub rail), the easiest way to check is to put the boat on a trailer and start adding water and see where it leaks out. Having said that, I would check the seal and nuts for tightness on both the shaft strut and rudder assembly, and also the tracking fins if they are bolt-through. as @footndale stated.. mine leaked as well.. and it comes in fast... I did not go through the steps of fiberglassing a new piece in which would have been best alternative. I unscrewed, removed old adhesive, applied new marine adhesive and screwed back together.. I had no more leaks during my ownership. Did they even have the HDS in 1991? Mine doesn't have a box. This last winter I was doing some major projects so I had that area about as opened up as can be (aside from removing the engine) so I put a wrench to them and was quite surprised at how many turns it took to fully tighten. Between that and my new shaft packing I no longer have a good stream of water coming out of my transom plug at the end of the day. If the base of the shaft log is leaking then it would seem like I'd just need to remove, add new sealant, and reinstall ? Right? Same would be true for the fins I assume. I might just do one fin at a time and see if there's any improvement. It's not the exhaust lines. I replaced the rubber joining pieces that connect the tips to the fiberglass pipe. I backed the boat down into the water while it was still strapped to the trailer so that the tips were completely submerged....no leakes from the tips, hoses or pipes. I did this while the gas tank was removed so that I could clearly see everything. So it wasn't running then? Affirmative. It wasn't running. Gas tank was removed. The amount of water running through the exhaust system at speed is pretty impressive. A very small leak in the exhaust above the waterline could be doing this, but only leaking while running. Nothing changes. I still take on water but I can't physically see where it's coming in. I'm about ready to put the water hose inside the boat and try to see where it's coming from. I'm wondering if it could be the fiberglass exhaust tubes. When @Falko asked about a muffler leak, he meant the fiberglass exhaust tubes. You should have inspected those when you changed the 4" hoses, but maybe you missed something. By the way, I don't think that changing the exhaust hoses was unnecessary. They do rot out, and I can't think of a better way to sink a boat than with a big hole in an exhaust hose. I say good job checking that off the list on an old boat. How are you using the boat when it gets water in it? Skiing? Surfing? Also, I'm assuming you have thoroughly checked the engine to make sure you don't have a rusted freeze plug or leaking head gasket. Water could run down the side or back of the engine and not be very visible. There's not much room to watch it drip off the oil plug. I went back and re-read your original post...did you seal the swim platform bolts with 3M 4200 or something similar? Thanks for keeping the thread alive. To answer some of the questions...I used 4200 to seal the swim platform bolts and I added a 1/4" plate on the inside of the hull to secure the platform more secure. No leaks from that location. I did notice that several of the through hull bolts for the fins were not tight. I removed, caulked, and tightened all through hull bolts. I was hopeful that was going to be the fix...nope. The water seems to come in faster when surfing. Does it come in any vents on back of boat? When surfing my 12 VLX it always gets water in the rear vents on corners when stopping and roller hits back of boat. I didn't see where you resealed under the rub rail. You may be forcing water through the gap between the top and bottom hull shells. They try to seal that at the factory, but sometimes a little gap happens. Have you ensured the shower (if installed) is off? Alright, this thread motivated me...while compiling a list of possible leak candidates I was a bit surprised to discover the list was quite long, so I figured why not write a proper guide/checklist to help the next guy. I submit this with the hope that others here will contribute to it by adding, subtracting, refuting, fixing, rearranging, or doing whatever it may be to help make the "Water Leak Troubleshooting Guide" a proper addition for the group in the hope it helps others. WARNING: do not run engine while boat is floating on water if bilge pump cannot keep up with an excessive leak condition. An uncontained raw water engine coolant leak from any area downstream of the raw water pump is capable of producing upwards of 20 gallons per minute of water. There are 3 general categories of leaks on a boat. The first step is to determine if it is a passive, engine cooling, or active leak. 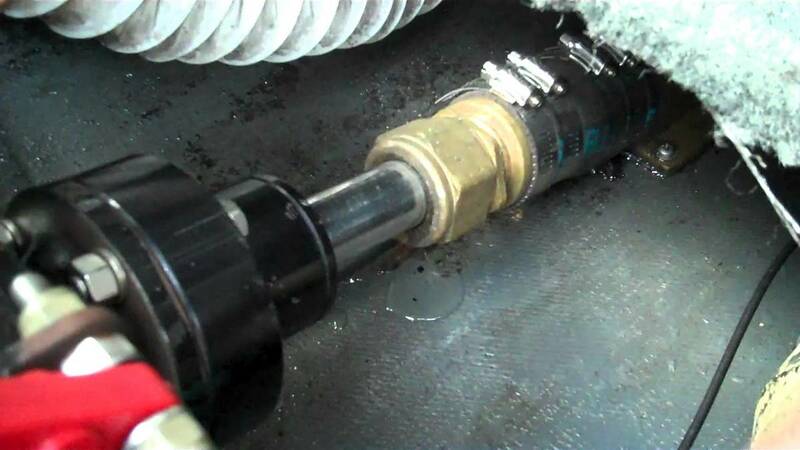 If basic troubleshooting/observing has not identified the leak source, then you may eliminate a category of leaks by first leaving a dry boat stationary in the water to determine if it is a passive leak. If no leak occurs, the next step is to run the engine either in the water (stationary/docked) or via the flush or “fake-a-lake” mechanism to determine if it is an engine cooling leak. If no leaks result from either test, then you’ve narrowed it down to an active leak for further troubleshooting. Once your category of leak is established, see the following lists to further troubleshoot the leak source. o Ballast system valves, hoses, pumps, and bags/tanks. If you have determined your leak is passive (e.g. leaks when moored), completely dry the boat and either place it into the water and carefully find the source or alternatively (and sometimes easier) take your dry boat and slowly add water to the bilge with an observer watching for a leak from below to identify the exact source. Caution: DO NOT raise the water level so high as to get the rudder cable wet; this will ruin the cable as it draws in water (and bilge filth) into the cable housing making steering stiff; rudder cable replacement will eventually be necessary. @formulaben: good document. FYI - a raw water pump delivers pretty close to 10 gpm per 1,000 rpm so the flow rate will depend on engine RPM and it is pretty linear since a positive displacement pump. I have a 2006 247 and after a year I finally found my leak. Prop Shaft Strut was loose. I put a screwdriver on them and only 1 bolt was tight. All the others just spun in place.